This listing includes the gong size of your choice, gong stand, and mallet. 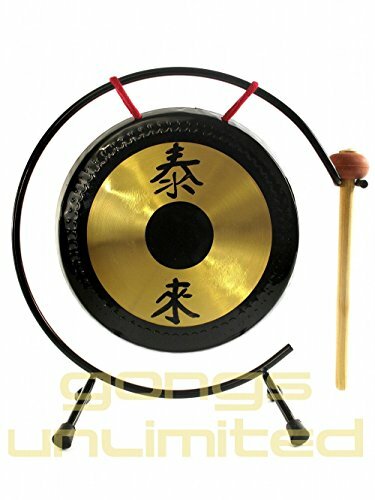 PLEASE NOTE: This is a pretty gong, but it is made of brass NOT bronze, like traditional Chinese Gongs, and so it sounds more bright and tinny. The Tai Loi is a traditional Chinese Ideogram that has been put on gongs for many years. It is a blessing or prayer which can be loosely translated to English as "The Bad will Depart, the Good shall Arrive" or more simply: "Happiness Has Arrived." Our Shiny Table Tai Loi gongs are made of brass, in Taiwan. They are a lighter metal and have a crashier, brassier tone. What's wrong with a little happiness arriving?! Absolutely nothing. Especially with the sweet sound of these Tai Loi Gongs. It is the little miracles, the small kindnesses that do a heart and a soul good in the midst of difficult, sad or lonely times. If you have any questions about this product by Unlimited, contact us by completing and submitting the form below. If you are looking for a specif part number, please include it with your message.